Perched high above the Himalayan town of Leh, a warren of traditional mud-brick houses squats by the ruins of the royal palace and a monastery, appearing to grow out of the mountainside. These homes in the capital of India’s Buddhist Ladakh region, which have stood for centuries, are regarded as some of the best remaining examples of urban Tibetan-style architecture. Conservationists are increasingly fretting about the survival of these medieval buildings in the Old Town. The New York-based World Monuments Fund in June put Leh’s Old Town on a list of the world’s 100 most endangered sites, citing a host of factors as a cause for concern, including more rain from climate change in the usually arid region. But, although Leh last year received unusually heavy downpours that caused several of the flat roofs to cave in, a walk through the old area shows that decades of plain neglect are more to blame than anything else. 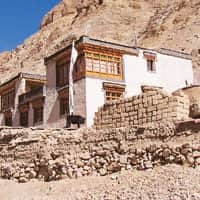 “For the last 15 years, people have been moving away," said conservationist Andre Alexander, head of the Tibet Heritage Fund, which has been working for the last four years to restore buildings in Old Leh. “There’s been a build-up of infrastructure in the modern town. The contrast has helped to convince people there’s no future in Old Town." The three-storeyed houses are perfectly adapted for the cold, dry climate, with the thick walls, great for keeping warmth in while numerous tall windows let in lots of sunshine. They are beautiful, too, with carved wooden window frames and narrow stairs that lead out to rooftop terraces that look out over the valley below. Alexander’s conservation group offers financing to locals still living in the area, mainly poor labourers, to help them restore their homes, which can cost as much as $1,250 (about Rs50,000). “Before, the roof was falling. The walls were crooked. There were many cracks," said Tsering Dorje as he sipped butter tea made with yak’s milk in his spruced-up house. The impoverished mason got help from the group by offering to do all the work himself. Alexander believes that as Tibet’s capital, Lhasa, becomes more modern under Chinese rule, it has become more important than ever to protect Leh’s architecture. Tibet-influenced Ladakh shares many cultural similarities with its trans-Himalayan neighbour, which China has ruled since 1951 after sending in troops to “liberate" the region the previous year. “In Lhasa, there is not so much left. The government had a very different vision of what Lhasa should be—very modern," said Alexander who worked in Lhasa before moving to Leh in 2003. “Leh now has much more than Lhasa." But Leh’s Old Town is still ignored by the authorities. Says Tsewang Rigzin, new tourism councillor for the Ladakh Autonomous Hill Development Council: “In the last 15-20 years, there’s been very bad planning for Leh. Everything has gone on in a very haphazard manner." The World Monuments Fund said the authorities could do a better job of maintenance, as well as monitoring new construction. “These buildings have survived centuries but some of them have not been attended to. Properly maintained, using traditional materials, these buildings can last for centuries more," says Mark Weber, fund technical director.